New to the forum. I have 1" front lift, 1.5" in the rear. I bought aftermarket rear camber bolts to hopefully get to 0 all around. Every single tutorial I saw online said that the camber tab on the rear need to point inward for max negative camber. The alignment shop seemed annoyed when I pointed out this and told me the the rear is maxed out and A) they can't point the tab toward the strut and B) it doesn't matter anyway. I went to my good mechanic and spoke to their alignment guy. He ALSO said it doesn't matter where to tab points, but that the other guys were just being lazy and just trying to adjust it by the cam bolt only. So why does every single tutorial online say to point the camber bolt tab toward the strut and now two shops are telling me that is hooey? Has anyone else had a problem getting to 0 on the rear with a 1"-2" lift and aftermarket camber bolts? Thanks for any advice. Did you make it clear to them that you had replaced the standard non-adjustable bolt with an aftermarket eccentric camber bolt ? Maybe take the whiteline install guide with you next time you talk to them and understand why they're saying what they are. Don't forget their default assumption is usually 'customer doesn't know what he's talking about', so take it easy. The strut is pushed towards the tab direction - so if you replaced the upper bolt, then tab-towards-strut indeed gives negative camber. 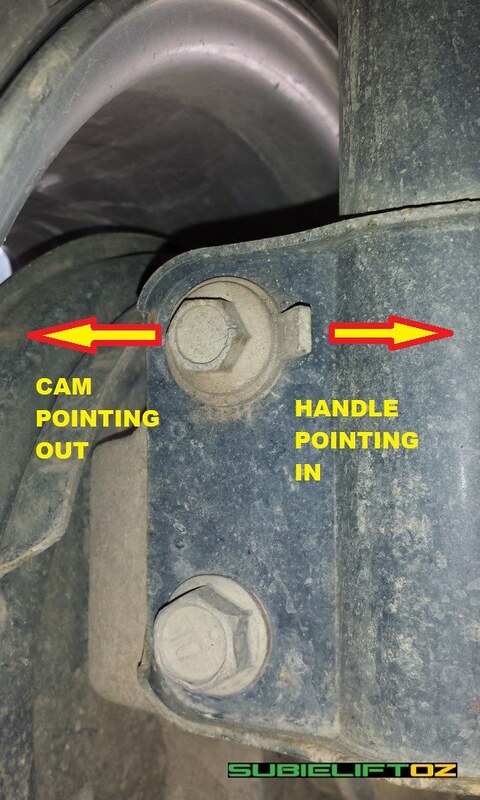 Both bolts need to be adjusted (factory camber and aftermarket) to get the camber desired.. I would think it would be best to set the factory to zero on its scale, then adjust the aftermarket to alignment spec. That way, a later alignment shop is less likely to get confused, and will be able to set camber to spec with just the factory bolt. I'm a little bit confused by your above description.. . but it sounds like the alignment shop is full of it anyway, or doesn't understand that the bolt is not like a factory bolt, and relies on the tabbed washer (actually, the nib on the other side) to push the shank against the strut flange rather than the larger-sized shank of a factory camber bolt which snugly fits the flange hole. Yes the tab rotates -- Per the instructions, the little nib on the other side of the washer (180deg from the tab) needs to be aligned with the lobe for the bolt to work properly. ie: the tab needs to point 180deg from the lobe. 3. Note washer and location of small inner and large outer tab. Align small tab on camber bolt washer with eccentric cam on bolt. 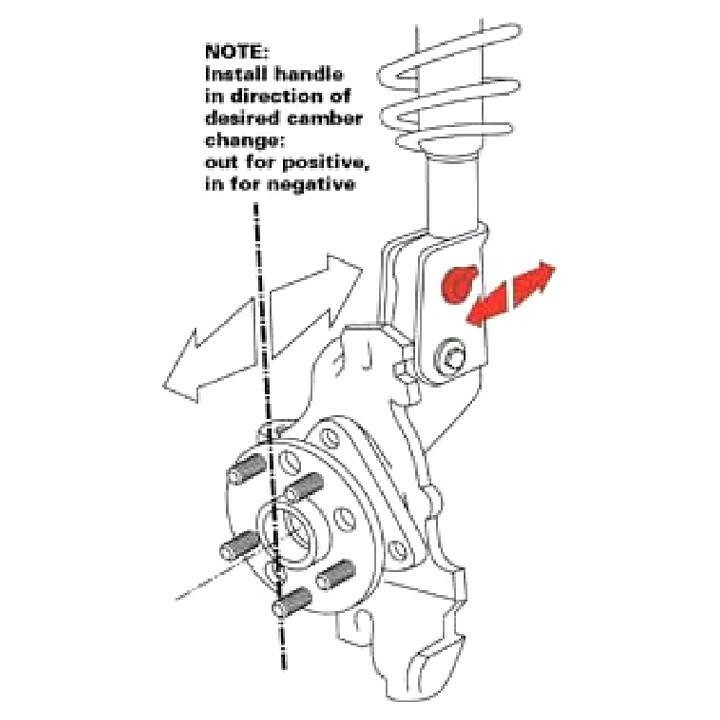 The whiteline directions are generic - and the pictures are wrong/misleading half the time (eg: for the Subaru liberty/legacy/outback front strut, the factory bolt is in the top, so you need to fit the aftermarket camber bolt in the bottom hole, and rotate the tab away from (lobe towards) the strut for neg camber). I assume you have a foz/impreza rear end with struts - is there camber adjustment from factory? If not, top hole is the go. If there is, then the aftermarket bolt goes in the factory non-adjusting hole.